Verso is located on a pedestrian street, and this is why we recommend parking in Verso's own, heated parking garage. 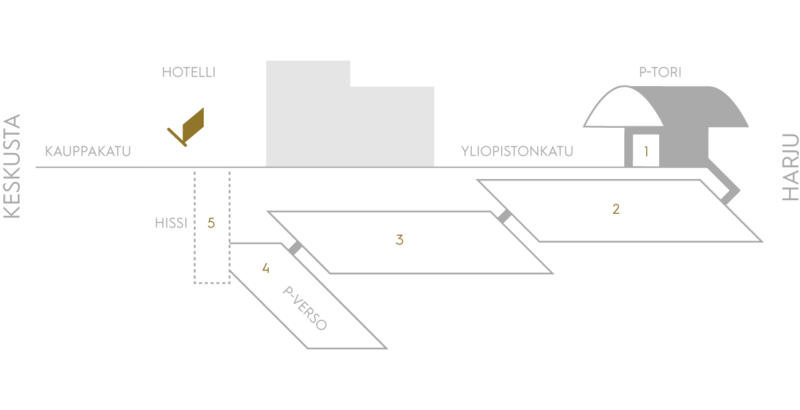 You can access the heated parking garage underneath Hotel Verso from Yliopistonkatu, through P-Tori parking garage. An indoor elevator will take you right next to the hotel straight from the parking garage. The parking hall has is reserved only for our hotel guests as an extra service. 1. Drive into P-Tori parking hall from Yliopistonkatu, drive in and below the street level. 2. Take the ticket at the gate and continue straight towards the ramp to the lower level, following the signs for Hotel Verso. Use the ticket you received on the second ticket machine. 3. Follow the ramp to the floor below, to Hotel Verso's parking hall. 4. Park in a spot marked with Hotel Verso's sign. 5. Follow Hotel Verso reception signs to the elevator and go to level 1a. Remember to notify the reception staff in order to receive your exit ticket.